What better way to celebrate Halloween than with the Midnight Ridazz in LA? Oh and of course, dressed up as your idol–in my case, Harry Potter!! 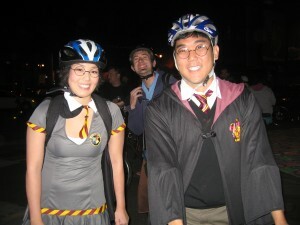 I rode around the streets of Downtown LA in full costume with Bryan, also dressed up as HP. (I mean, HP does magic right? He’s totally capable of making more than one Asian version of himself…) My cape was flowing in the wind, Hedwig (the owl) was taking a ride on my back as I pedaled through the otherwise empty streets of DTLA on my broom bike. LA never looked so beautiful. Ride on! !